Beautiful prisons are a recurring theme in this story of the fae. 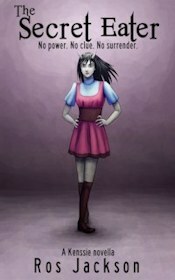 In modern day Manchester Cathy has been living as a student after slipping the leash on her stifling life in the Nether, a sort of nowhere place between the real world and fairyland. As a member of the Great Family of Rhoeas-Papaver she was expected to marry according to her father's wishes and live a dull life in the half-lit world in the service of the Fae. She wants to study and love as she chooses, but her family disapproves. So she's a cursed rebel, and she relies on charms to prevent them tracking her down and bringing her home. The Fae live in Exilium for the most part, and that's another kind of beautiful prison. They aren't supposed to come into Mundanus, which is their word for the normal world. However some of them have been in Bath, where they've been up to no good and have allowed a mundane person to see them. It's the job of Arbiters to keep them in check and protect innocents from their mischief. Max is an Arbiter, which is a kind of supernatural detective with a dislocated soul that he keeps apart from himself in order to protect him from the influence of magic. This leaves him emotionless and ugly. He's working on an investigation in London when something goes wrong with his home chapter of Arbiters back in Bath. Max is left with a stone gargoyle that embodies his soul, and no support to figure out why innocents are disappearing and what has happened to his colleagues. Cathy has to face her angry family in the Nether, and the possibility that they will force her into an unwanted marriage. But her fae patron, Lord Poppy, offers her three wishes, with conditions. She's well aware that the wishes will be more of a trap than a blessing, and if she fails to impress him he has the power to enslave her, or worse, as a punishment. After the first 100 pages or so the two main threads still don't seem to be very connected. Max's world of detective work, crazy sorcerers, gun battles and corruption seems far more dangerous than Cathy's problems with stifling manners and otherworldly curses. The Great Families live in reflected cities that are a shadow of their real-world counterparts. They spend too much time at parties, and nobody seems to do any work. They're stuck several hundred years in the past both technologically and in terms of their mores. This does make it difficult to have any sympathy with most members of the fae-touched families, who Max characterises as puppets. Some of the story is told from the point of view of Will, a young man who tries to conform to the role set out for him by fae-touched society, even though he doesn't like it. He's not very sympathetic at first, until we realise that he's just as trapped as everyone else and he shows some backbone in his attempts to make the best of a bad situation. I liked Cathy, who has almost stepped back in time and has to go through the struggle for women's liberation all over again and without the aid of Emily Pankhurst. She has to go back to a place that's untouched by education or progress, and she has to prevail without the benefit of superior strength, using only her wit and force of personality. When it comes to Max I loved the contrast between his rational half and his exuberant and expressive gargoyle soul. The fae in the story are wicked, tricksy and very aloof, but they're so manipulative that they can't even be trusted to be reliably malevolent. They are alien in their appearance and manner, but they aren't the only party looking to change the status quo. 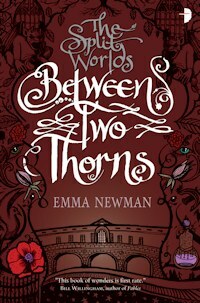 So Between Two Thorns is a fascinating new take on the fairytale myth, and it keeps the elegance and old-fashioned glamour we tend to associate with the fae whilst adding a fresh modern perspective. I thoroughly enjoyed the mystery, whilst between imminent marriages and young men demanding satisfaction in the name of honour there's a lot to keep the pulse racing.